The Australian Maritime College and South Metropolitan TAFE have strengthened their joint capability to supply skilled workers for Australia’s naval shipbuilding program with an agreement to collaborate on education and skills development. The two organisations have signed a letter of intent to develop direct study pathways from South Metropolitan TAFE’s vocational training programs to the Australian Maritime College specialist undergraduate degrees in the areas of maritime engineering and global logistics management. University of Tasmania Vice-Chancellor Professor Rufus Black said the collaboration would provide clear benefits to students, as well as ensuring education and training providers were meeting the needs of the defence and shipbuilding industries. As a national institute, the Australian Maritime College is very much looking forward to collaborating with South Metropolitan TAFE to create more opportunities for more students in Western Australia to participate in the growth of the shipbuilding industry. This new collaboration builds on a longstanding partnership between South Metropolitan TAFE and AMC for articulation from their seafaring courses. “We are pleased to extend the collaboration by providing additional pathway options to support the national shipbuilding industry,” South Metropolitan TAFE Acting Managing Director Annette Keller said. Naval Shipbuilding College Program Director, Bill Docalovich praised the educational partnership which is an important step in progressing the nation’s naval shipbuilding agenda. “This is not only a tremendous milestone for both educational institutions, but it’s a critical development to the success of the continuous naval shipbuilding program in Australia,” he said. The Naval Shipbuilding College is working with the shipbuilding industry and training and education sectors to create a skilled sovereign workforce for the $90 billion ongoing shipbuilding program which will build new frigates, submarines and patrol boats for the Australian Navy. More than 15,000 people across a diverse set of occupations are ultimately expected to be employed directly or indirectly for the continuous shipbuilding program which includes the full supply chain and providers of sustainment services. 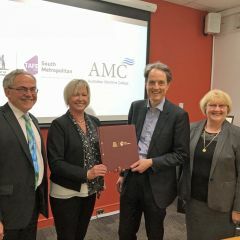 The collaboration with South Metropolitan TAFE follows an agreement between AMC and TAFE SA to work together on training pathways signed on 18 July, 2018. (Photo): College of Sciences and Engineering Executive Dean Professor Brian Yates, South Metropolitan TAFE Acting Managing Director Annette Keller, University of Tasmania Vice-Chancellor Professor Rufus Black and South Metropolitan TAFE General Manager Training Services Brenda Micale.